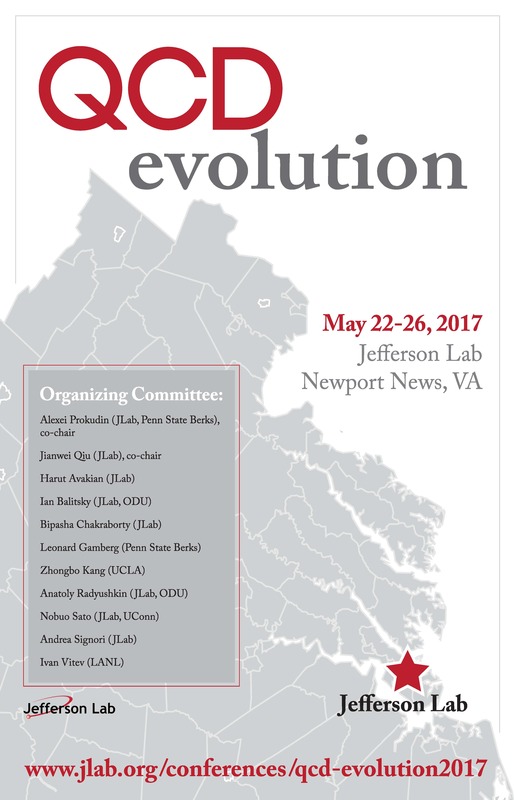 The QCD Evolution 2017 workshop will be held at Jefferson Lab, May 22-26, 2017. The workshop is a continuation of a series of workshops held during six consecutive years, in 2011, 2012, 2013, 2015 at Jefferson Lab, and in 2014 in Santa Fe, NM, and in 2016 at the National Institute for Subatomic Physics (Nikhef) in Amsterdam. With the rapid developments in our understanding of the evolution of parton distributions including TMDs, GPDs, low-x, higher-twist correlation functions, and the associated progress in perturbative QCD, lattice QCD and effective field theory techniques, we look forward to yet another exciting meeting in 2017. The program of QCD Evolution 2017 will pay special attention to the topics of importance for ongoing experiments, in the full range from Jefferson Lab energies to RHIC and LHC energies or future experiments such as a future Electron Ion Collider, recently recommended as a highest priority in U.S. Department of Energy's 2015 Long Range Plan for Nuclear Science. To request an invitation letter, please contact qcd2017@jlab.org as soon as possible.